The Hubby and I hit the States last Friday and stopped in at one of our favourite grocery stores. They not only seem to have great deals on meat, but they carry bottles of cold brew coffee that I love. The time previous we picked up two giant t-bones for $12, this time was a giant slab of meat, a cut called London Broil. Hubby remembered seeing something about it making a great meal. Let me tell you, not only does it make a great dinner, it makes a great lunch, and two dinners. This is a very simple dish, with the thing taking the longest being the marinating. 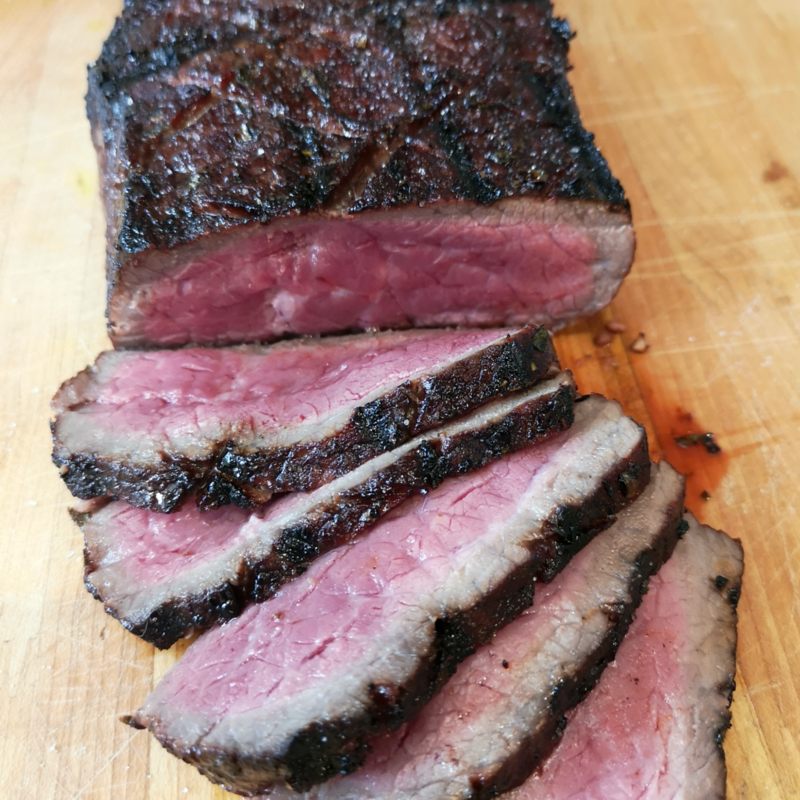 The slab of beef we picked up was about 2 inches thick and instead of starting the oven when it was 35°C out, I booted up the bbq and seared it off for 7 minutes a side and it was rare inside. Just sear for a little longer for a medium rare. I served with a red wine mushroom sauce and a dollop of horseradish. Hubby had found a copy of The New Professional Chef: Culinary Institute of America for me and going through it I saw a recipe for mushroom sauce that I thought would go amazing with the beef. I Frankenstein’d the recipe, using altered mushroom sauce and jus de veau lié recipes from the book. Lightly score the meat on both sides in a diamond pattern. Put all the marinade ingredients in a ziploc bag. Add the meat to the bag and massage the marinade in. Let marinate for 1-2 days. Heat a bbq to high temperature. 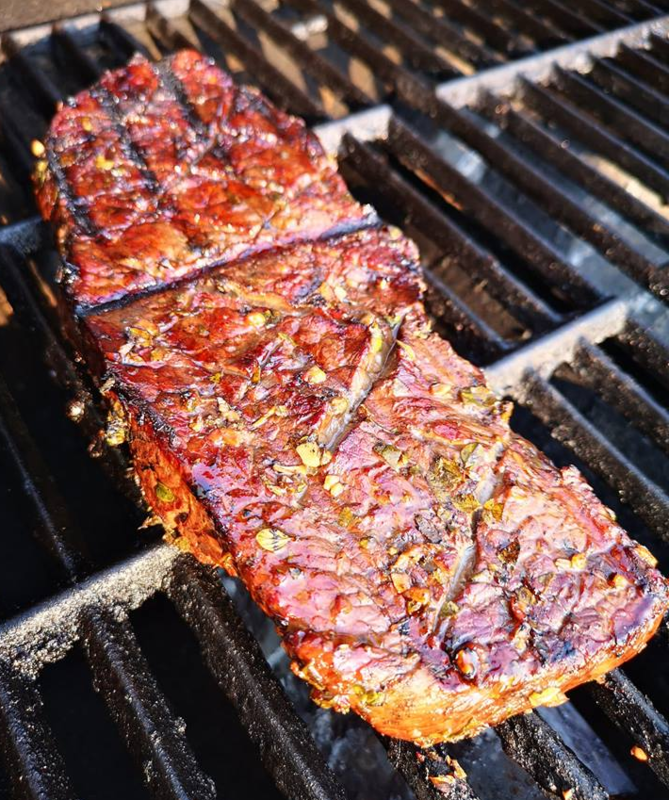 Once hot, turn down to 350°F, remove the meat from the bag, let the marinade drip off, and place on the bbq. Let cook for 7 minutes, flip over and cook for another 7 minutes. Remove from the bbq and slice against the grain. Serve with horseradish and mushroom sauce.